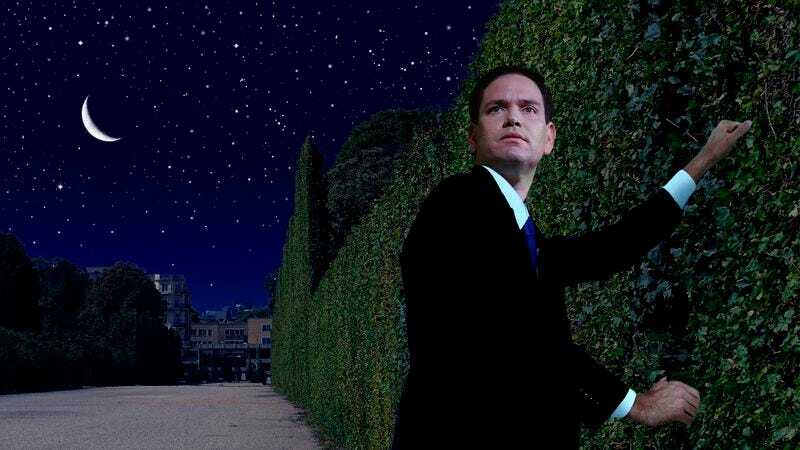 WASHINGTON—Vaulting the ivy-covered garden wall and padding silently to the rendezvous spot beneath the lightly swaying linden trees, Sen. Marco Rubio (R-FL) reportedly engaged in a forbidden midnight meeting Wednesday with a super PAC supporting his presidential campaign. “I know what will happen if they catch us like this, but I needed to see you,” said Rubio, telling the Conservative Solutions PAC that no cruel regulation would stop him from coordinating with the fundraising committee he cherished above all others in the world. “Let the Federal Election Commission try to keep us apart. I don’t care. We were meant to run this campaign together, and I would rather die than do it without you by my side.” At press time, however, a tearful Rubio was telling his beloved 501(c) organization to always remember how important saturating early primary states with attack ads is before disappearing back into the warm summer night.